This week I started using another ebook reader called Mobipocket. I'd heard about it before and was hoping that maybe I could get a better selection of ebooks if I expanded from eReader (yes, I was looking for more Ian Rankin—can't seem to find the early ones in ebook). So far, I'm not particularly impressed by the selection of titles. However, I'm intrigued by the possibility of buying and downloading directly to my phone. I'll write a more detailed post once I'm more familiar with the software and service. 1. Liberty, Missouri is not the bland suburb of Kansas City that I had assumed. It is a charming town with a lively square full of shops and restaurants. 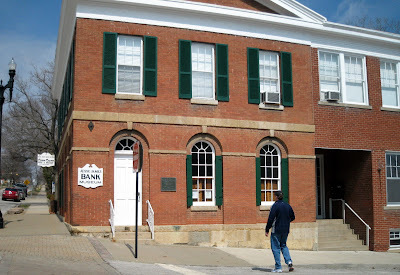 The sight of first armed bank robbery in the United States in peacetime. One of the robbers was Jesse James. 2. 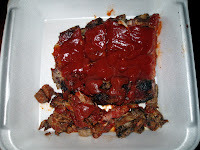 Everything I've heard about Kansas City BBQ is true. 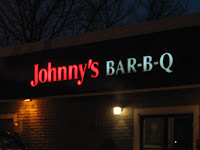 Gretchen and Mark suggested we go to Johnny's (I think that link is correct). I was too busy digging in to take a picture of our meal, so you'll have to settle for the leftovers. 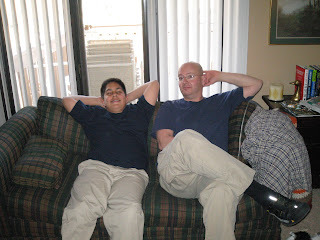 3. RJ and Jamie are twins! According to Tessa, anyway. Knots and Crosses is the first in the Inspector Rebus series and I'm looking forward to working my way through the rest of them. I read the mass market edition of this one. I'm hoping to find the others as ebooks. I'm not exactly your nature-loving outdoorsy type. Sure, I like to see interesting animals and their habitats—on TV. And, to be honest, I generally find birds pretty boring—I've never understood bird watching. Maybe it's because I have such poor eyesight. However, I have experienced firsthand the sandhill crane migration through Nebraska and it is quite the spectacle. Is it because the birds are so big? Or just because there are so darn many of them (over 400,000!)? I don't know, but I highly recommend the experience. 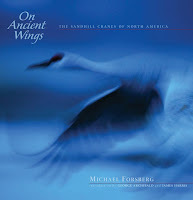 Even if you haven't seen them in person you'll enjoy the amazing photographs by Michael Forsberg in On Ancient Wings: The Sandhill Cranes of North America. He is also featured in Crane Song, a documentary from NET Television (Nebraska's PBS station). Also, (boy does he get around) there is currently an exhibit featuring Forsberg's photos at Morrill Hall (the University of Nebraska State Museum). With 153 stunning color photographs, On Ancient Wings presents sandhill cranes in their wild but increasingly compromised habitats today. Over the course of five years, Michael Forsberg documented the tall gray birds in habitats ranging from the Alaskan tundra, to the arid High Plains, from Cuban nature preserves to suburban backyards. With an eye for beauty and an uncommon persistence, the author documents the cranes’ challenges to adapt and survive in a rapidly changing natural world. Forsberg argues that humankind, for its own sake, should secure the cranes’ place in the future. On Ancient Wings intertwines the lives of cranes, people, and their common places to tell an ancient story at a time when sandhill cranes and their wetland and grassland habitats face daunting prospects. Paul Johnsgard follows these elegant birds through a year’s cycle, describing their seasonal migrations, natural habitats, breeding biology, call patterns—angelic to the bird-lover’s ear—and fascinating dancing.The largest and most spectacular migratory concentration of cranes happens each spring when the Platte River valley becomes the staging ground for an amazing gathering of four hundred thousand to five hundred thousand sandhills en route from the South to the Arctic tundra. Johnsgard describes this incredible event as well as memorable personal encounters with the cranes. His knowledge of them transcends natural history, covering their importance in religion and mythology. It is something we seem hard-wired to do, says Dr. Biederman. When you find new information, you get an opioid hit, and we are junkies for those. You might call us 'infovores.' "
. . . in the digital realm, as we've seen, the main feedstocks of the information economy—storage, processing power, and bandwidth—are getting cheaper by the day. Two of the main scarcity functions of traditional economics—the marginal costs of manufacturing and distribution—are rushing headlong to zip. Some thoughts: in order to take advantage of this publishers need to maintain a stable and strong technology infrastructure so that as new possibilities arise they aren't cost-prohibitive because you're playing catch-up. This doesn't have to mean a huge IT department (judicious outsourcing is a good thing), but it's not an area you want to skimp on. A solid IT infrastructure/strategic plan should strive to be flexible and scalable enough to incorporate new technologies as they arise and anticipate them whenever possible (without too much pain. A little pain is to be expected :). Also check out the free how to wiki. Wow. I love her more with each book. In Exile, it was especially her depictions of poor Jimmy and his four kids that I found to be so bleakly realistic that they were painful at times. Yes, that's right—I have no problems with violence or gross things, but Jimmy caused me pain. Without seeming to have moved, the babies had somehow gotten closer to the fire. It was obvious that they had been told not to go near it; they were watching Jimmy's legs out of the corner of their little eyes, their backs stiff with naughty apprehension. Maureen pointed to them and Jimmy swung around. "Get away," he said, slow and threatening, raising his hand over his head. The babies scuttled backwards, grinning and keeping their eyes on the gorgeous flames as they held on to the armchair. Maureen told Jimmy to finish dressing them, and would he mind if she went up to see Alan? Jimmy cringed. "It's no' very tidy." Next up, Knots and Crosses by Ian Rankin (mass market paperback) and Sedaris by Kevin Kopelson (cloth). Now in its third century of publishing, John Wiley and Sons is finding new ways to connect its customers with its content. "Attention, all you memoir fabulists!" In response to public outcry, Erewhon Publishing has instituted a stringent new "cards on the table" policy. In the future, every memoirist will be required to provide evidence of his or her dysfunction: arrest records, needle tracks, urine and stool samples—and in the case of Martin Amis, dental bills. Scary relatives must provide DNA evidence of kinship. Wish-fulfillment detectors will be distributed to editors on an as-needed basis. In the meantime, Erewhon Publishing has instituted a comprehensive fact checking of our back catalog. The article goes on to describe "troubling inconsistencies" in the Bible, The Adventures of Buffalo Bill Cody, The Diary of Anne Frank, and others. Hogmanay (pronounced [ˌhɔgməˈneː] — with the main stress on the last syllable - hug-m'NAY) is the Scots word for the last day of the year and is synonymous with the celebration of the New Year (Gregorian calendar) in the Scottish manner. Its official date is 31 December (Auld Year's Night). However this is normally only the start of a celebration which lasts through the night until the morning of Ne'erday (1 January) or, in some cases, 2 January which is a Scottish Bank Holiday. The 2008 Dewey Donation book drive started in February. Go here to find out how to donate. I recently decided to read Ian Rankin's John Rebus series. I know there are a bunch of them because I've been hearing good things about them for forever. Obviously, I'd like to read them in order. As I mentioned in a previous post, I purchased the ebook version of Resurrection Men and while I was enjoying it, I wasn't exactly keeping up with all that was going on. I told this to my pal/nemesis Td over lunch on Friday. He then informs me that of course I can't follow it—Resurrection Men is one of the later books in the series. Which brings me to my point: for the love of all that is holy, why is it so hard to find a list of titles by an author that is sorted in chronological order? Amazon doesn't do it (Oh, don't get me started on Amazon's search results. Or how hard they make it to figure out which edition you're seeing). You can't even count on the publisher to list them all in the book in the right order without mixing in titles not in the series. Ian Rankin's website doesn't appear to do it, either. It looks like the wikipedia page for DI John Rebus lists them at the bottom. And later on Friday, the ever-helpful Td sent me a link to someone's listmania page at Amazon that lists them in order. So, yes, the information is available. But wouldn't it make more sense for the seller (whether Amazon or eReader or whoever) to provide it to me? Think how much more money I'd be willing to spend if I weren't so busy being annoyed.